In today’s episode of Join Up Dots we look at what makes a successful business and why so many people nowadays truly go the hard way to success. But first of all lets start with answering a few questions from listeners across the world who have been following the show. The first one, is less of a question and more of a statement, but it comes from a guy in Perth Australia, who I have had the pleasure to connect with a chat to over the last few months. His name is Craig and he is an English guy living and working in Australia, who mention that he often lacks focus and will allow days to drift into weeks without achieving what he truly wants. He said “David, I need some of that focus you have! I love how you are able to visualise and attack! Has it always been a skill of yours or is it learned? Of course to hear the answer you will need to listen to the show….we cant have people just reading a podcast and not giving us our ears after all. The second question that comes from a lady also in Australia called Ebony Richards from Hobart Australia, is in regards to creating success and the mistakes that I have made in the past. She says “David Ralph, podcasting legend. Why did it take so long for you to come into my life. I am well and truly hooked and listen to multiple episodes a day. But for all of us, listening and hoping for the day that we can become our own boss. What have been the biggest mistakes (if any) you have made through your business? If you say that you have never made a mistake then I will quit my job today…..not! Thanks for a great show and look forward to being a guest on Join Up Dots one day. Ebony Richard, Hobart Australia. 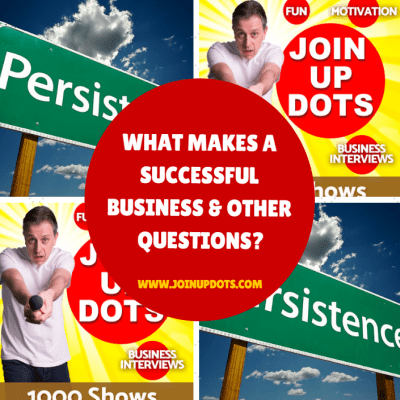 Now we have got those out of the way, it’s time for us to look at what makes a successful business. I will butet point them into three main categories and you will see that they are not anything clever in any shape or form. Number One: Look for a need that is already out there already. What I mean by this, is dont try to be clever and create something unique. This is prone to failure, even though the upside if its a success is massive. I would much rather see something already working and then create something similar with a different spin on it. Number Two: Now that we have a need, we need to seriously think about who our customer is and where they are hanging out. You dont want to ne spending a ton of money on throwing mud at the wall and hoping that it sticks. Number Three: Own your own traffic. You really need to be able to communicate with your audience, whether that is through Facebook, Email marketing, or any form of collection. Without that your business is dead in the water.